Although there are no doubt many things we have been learning, the key ones have been around the area of trusting God and maintaining perspective. In twenty odd years of following Christ, I still somehow tend to think that my plans are the best ones. It doesn’t seem to matter how many times experience and hindsight teach me the opposite, or how clearly God’s Word lays out the principle, I desperately cling to my own little sense of sovereignty and wisdom. Although, as a family, we have greater clarity now about many things, we still have some fairly fundamental unknowns – like precisely where we’re going to be living in the next three weeks! But even here, God has been showing us mercy, revealing little elements of the plan stage by stage. Showing us tokens of His grace through the kindness of His people. And we have been struck again by the wisdom of His timing. Our own move, which we expected might happen as much as a year ago, has been delayed in a way which has brought some healing (for us), some help (for another) and I suspect some blessing for the local Church. Most, if not all, of these might have been lost had we followed our own plan. And even at this point, with the uncertainty ahead, I am struck by the kindness of God in positioning these lessons around the great celebration of Easter. What an amazing reminder of God’s perfect (though often surprising) plans, His detailed (though often delayed) timing, and most of all of His enormous and costly love. And when we allow the great hope of Easter (He is risen! Death is defeated! Sin is dealt with!) 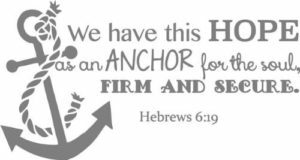 to anchor our souls, then it puts all our other momentary and light troubles (2 Cor 4:17) into perspective. My challenge, and perhaps yours, is to allow this truth to sink right down into our hearts. To allow it to move from truth to which we assent and which we (maybe often) vocalise – to a place deep in our hearts which bubbles up into assurance and confident hope. It means that as I get up in the morning and try to lead and care for a family who are as unsettled as I am, I need to keep looking to that cross and reminding myself of the active, purpose-filled, hope-giving work of my Saviour. And then point them to Him too. It means that as I face circumstances which don’t conform to the neat little plan I had in my mind, that I need to remember they are being presented to me by a loving Father who is working all things for my good and which will one day make more sense. And it means that I should grow in my longing for heaven, a place where all this uncertainty is gone and there is only joy and praise and wonder. 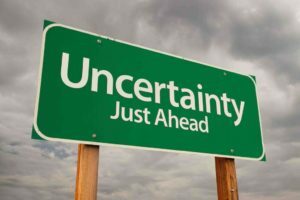 2 Responses to "Uncertainty, Faith and First Importance"
Thanks phil; your words have nailed it as a great and timely reminder (start new job tomorrow), And rooted in scripture; thank you. Praying right now that your new job starts really well and that you are able to be a great ambassador for Christ as well as a wonderful and gifted employee!